On Saturday after R4's baseball game we headed home to take care of a few things around the house before R8 had his hitting lessons. Upon arrival home, Hubs parked the car at the end of the drive way so the boys could play out side while I worked in the kitchen all the while keeping an eye on them. We started to walk into the garage and Hubs starts telling all of us to wait and hold up. I ask him whats the problem and he says one word...SNAKE! I look just in time to see something slither off behind our extra fridge and behind the the rack that holds my brooms and mop. SNAKES DO NOT BELONG IN MY GARAGE OR ANY WHERE NEAR MY HOUSE FOR THAT THAT MATTER. I get the kids in the house through the back door and leave Hubs to find our visitor and KILL IT! Once everyone is settled I put on my Crocs, like that will stop the thing from biting me, and head into the garage to help. By this point Hubs has moved everything and can't find the freakin' SNAKE. So I tell him to move the old mattress and box spring leaning up against the wall out of the way. Yes that would be our old mattress and box spring that had water damage, completely soaked, thanks to Hurricane Ike. I would love to get rid of it but because of health issues the dump won't take it. So what does one do with an old mattress? Any suggestions here would be greatly appreciated! And low and behold the SNAKE is behind them and won't budge. Hubs positions himself at one end and I get the broom and start to push at it from the other end. It comes out and slithers right under our shelving unit. Long story short, Hubs goes on snake watch, complete with lawn chair, a coke, and the offer of one chicken nugget. Oh yeah and a shovel. He is at it for about 45 minutes and gives up. Saying that the SNAKE is stuck under there and is probably dead from all of the bug spray he used to try and force it out. So he stuffs a towel in the end where it crawled in and comes inside. WHAT?? IT"S STILL ALIVE??? Hubs you are staying outside until the feakin' thing is DEAD, would have been my normal response. But I was so exhausted from all the baseball and the fact that R4 woke me up at 6:45 in the morning that I let him come in and fix himself some lunch. And I lay down to take a nap. I woke up with just enough time to get everyone ready to head out to lessons that I didn't bother worrying about the SNAKE. I was just hoping it would crawl back out the way it crawled in. We get home, get everyone bathed and watching a movie and I remember I have to go out to the garage for something. I make Hubs get up go with me. Yes ma'am I'm a chicken. I will say it again, I'm a chicken. I walk over to where I need to go and then something catches my eye. There behind our hot water heater slithering out is the freakin' SNAKE! All calm and cool Hubs grabs one of the boys golf clubs and drags it out and then beats the thing to it's death. And while I can see blood on the garage floor and know it's dead there is something about a moving SNAKE that just doesn't say dead to me. But Hubs assures me it's dead and then picks it up with the shovel and throws it into the woods behind our house. Telling me some owl or other animal will come eat it. I have to say this, in the almost 8 years we have lived in this house I have never seen a SNAKE even near our house let alone in it. But I can say this, Hubs is one SNAKE killing king! Oh and if I was even some sort of decent blogger I would have pictures. But sadly I don't. All I do have is a blood stained garage floor...see. Oh my. Growing up in the neighborhood in which you now live...with that giant ditch behind the house...we actually saw very few snakes. HOWEVER! I moved to the city and we've had several snakes. The snake encounter of all snake encounters was the snake that perched itself on top of our FRONT DOOR WREATH!!!! I'm going to e-mail a picture of THAT to you. GIRLFRIEND. I'm with you...I'm a BIG chicken when it comes to snakes! 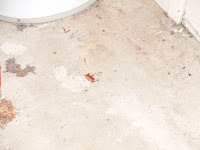 ps - please don't tell anyone but my garage still has blood droplets from where mr. right tried to sand his finger off. That is awful! I would totally freak and probably move. Don't even tell me snakes are out now! I can't take it! oh ick ick ick. I hate snakes. You're brave to even stay in the garage to watch the killing. Blech.